Work Gmail : aswinb.physATgmail.com (PGP Key) - This email is preferred for scientific correspondence. I am a theoretical physicist with a strong interest in related mathematics. Specifically, my interests are Quantum Field Theories (supersymmetric and otherwise), String/M Theory and aspects of Representation Theory. While it is almost tautological to say that Quantum Field Theories and Representation Theory are closely related, it turns out that we are discovering some very new aspects of this relationship. Exciting times! My publications can be obtained from INSPIRE . Masses, Sheets and Rigid SCFTs (notes) , UPenn Math-Physics Seminar (notes for a 60 min blackboard talk, video). "Geometric Langlands from 4d N=2 theories", Munich Fields and String Seminar + very similar talk at Institute of Mathematical Sciences, Chennai. The Langlands Dual Group and Electric Magnetic Duality - A short talk given at New Fellows meeting at DESY, Hamburg. The talk is mostly motivational/historical in nature, but I have emphasized some aspects that are traditionally not placed in the foreground of a physics discussion on Electric Magnetic Duality. 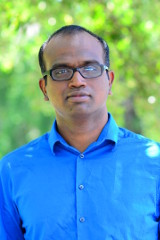 I was one of the organizers for a meeting titled "Quantum Fields, Geometry and Representation Theory" that was held in July 2018 at ICTS-TIFR, Bangalore . Here are the abstracts (pdf) and talk videos (on youtube) from the program. I have a page that collects literature on the gauge theory approach to the Geometric Langlands Program.